Looking back at Day 1 of the MLB Draft (Monday, June 12), 75 high school and college athletes were drafted. Now it’s a bit premature to be making any solid predictions, but I’m going to pick five players that I think will make an impact on your fantasy team soon. On average, it took players drafted out of college 2.75 years to make their debut. Players drafted out of high school on the other hand took over a full year longer to hit the big leagues. That shouldn’t be too much of a surprise to many as high school draftees still need time to strengthen and develop. As such, most of my picks will end up being players drafted out of four-year colleges. That doesn’t mean I think any of the players drafted from high schools will end up fantasy duds. I’m just choosing to focus on who will make an impact in fantasy baseball the soonest. Anyways, on to the picks! One of several two-way players that were featured prominently in commentary leading up to the draft, the Rays decided that they want McKay to man first base instead of taking the mound for the franchise. As a junior at Louisville this season, he batted .343/.464/.657 with 17 home runs and 56 RBI, and he struck out only 36 times while drawing 45 walks. He did all this WHILE spending a significant amount of time focusing on his pitching. Now that he will be playing first base, he can focus all of his attention on becoming a better hitter and fielder. Comparing him to another Rays first baseman, I think he could end up being Carlos Peña with a higher batting average. Another two-way player, although he has more potential as a hitter than a pitcher, Haseley finished his junior year batting .390 with 14 home runs and 10 stolen bases. Reading his scouting report and looking at his stat line, he reminds me of a prospect in the Dodgers system that I am high on, outfielder DJ Peters. Haseley is a guy I can see potentially rising through the system pretty quickly, and if he does we might not be that far off from seeing a potentially loaded Phillies outfield of Haseley, Mickey Moniak, and Nick Williams. When it comes to fantasy baseball, I always place a premium on fast guys. Jeren Kendall is a fast guy. Not only is he a fast guy, he can hit too. Kendall finished fourth on Vanderbilt with a .307 average, but he led the team in home runs (15) and the SEC stolen bases (20). The one concern with Kendall in making the leap from college to professional is his strikeout rate. Along with leading the conference in stolen bases, he also had a conference-worst 74 strikeouts. If he is able to keep his strikeouts at a manageable level, he could rise fairly quickly through the Dodgers’ system. While Kendall is rated as a fast guy by scouts, Quentin Holmes is likely the fastest player in the draft. Reports say that not only is he a major base stealing threat, but his speed also translates well into his defense as a center fielder. One thing to keep in mind though is Holmes is a high school draftee. 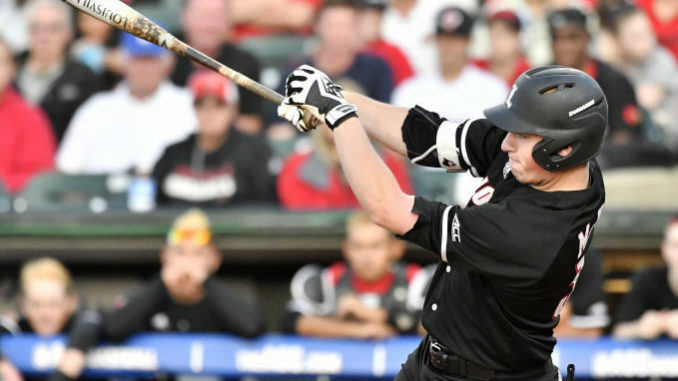 He hit well enough in high school, but how his hitting ability will translate to tougher competition in professional baseball remains to be seen. In terms of rising through the Indians system, after Bradley Zimmer there doesn’t seem to be much of a logjam of players Holmes would have to pass to end up in Cleveland. Out of the five guys I’ve written about here, I think Drew Ellis might have the quickest path to the majors out of all of them. As well as his teammate Brendan McKay did this year, Ellis did even better as he led the Cardinals in batting average (.367), slugging percentage (.729), home runs (20), RBI (61) and total bases (161). Jake Lamb is currently manning the hot corner for the Diamondbacks, but I have no doubt in my mind that Ellis is the heir apparent at third base, and I don’t think you’ll have to wait too long before you see him at Chase Field.